Quality and comfort, combined with innovative design and technology, such as GOLF STREET and BIOM. Ecco has become the "Brand in Demand". When we are onto something good, we try to make better. That is exactly what we have accomplished with our best selling Biom Hybrid Model. Ecco customers passions include looking and feeling great wherever they go, therefore Ecco provides them with the first classic crossover shoe as equally suited to the boardroom as the 1st tee. 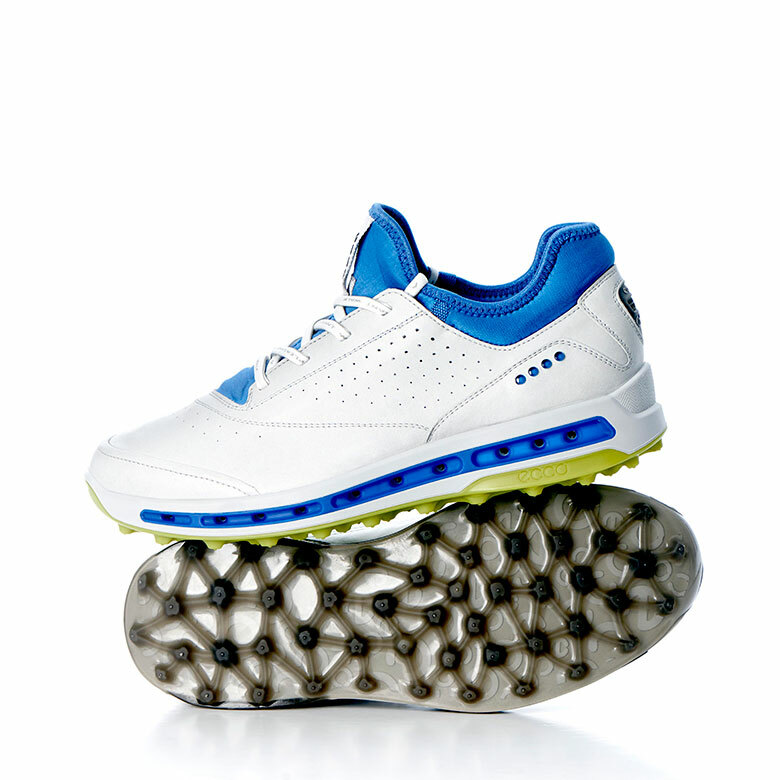 Ecco Dynamic Traction System, the patented outsole design consists of approximately 100 molded traction bars. Constructed from TPU – a highly durable, wear-resistant material- these elements boast 800-plus traction angles to provide excellent grip in all conditions. Largest assortment: At Holiday Golf you will find the largest number of models in Europe. Stock protection: Don’t worry if ECCO has run out of any product. For the best-selling models, Holiday Golf provides extra stock so you can secure replacements over a longer period, thus prolonging the sales cycle of these models. GORE-TEX: Most ECCO shoes are developed with GORE-TEX technology, highlighted by the highest standards for demand, quality and prestige at an international level. GORE-TEX is the only technology which can guarantee that the shoe is 100% waterproof while also, in addition, providing a fresh sensation when wearing an ECCO shoe – because, at the same time as no water is entering, humidity is being released. Exclusive initiatives: ECCO will be maintaining its leadership in the vanguard of the industry by increasing the number of new models launched during the year – not just with an annual collection. This means that in autumn, every year, we will have more than 20 new models, great news for all customers and tourists who travel to Spain to play golf, while their own courses are closed for the winter season. Opportunity: Thanks to next year’s models being received at Holiday Golf between October and November, golfers will be able to view the new Ecco models for the first time in Europe, generating great sales opportunities. ECCO, synonymous with quality: Ecco is the Nº1 brand in the golf sector in the Nordic countries, Germany, Benelux countries, Austria, Switzerland, etc., and continues to grow globally as a standard-bearer for quality and guarantees. Loyalty: ECCO customers are the most loyal in the market. Once they try these shoes, it will be hard for them to change to another brand. World leader: ECCO is the fourth leading global brand for urban footwear, with more than 20 million pairs sold a year. This makes it more likely for clients using the brand’s traditional footwear to acquire the same brand for playing golf. 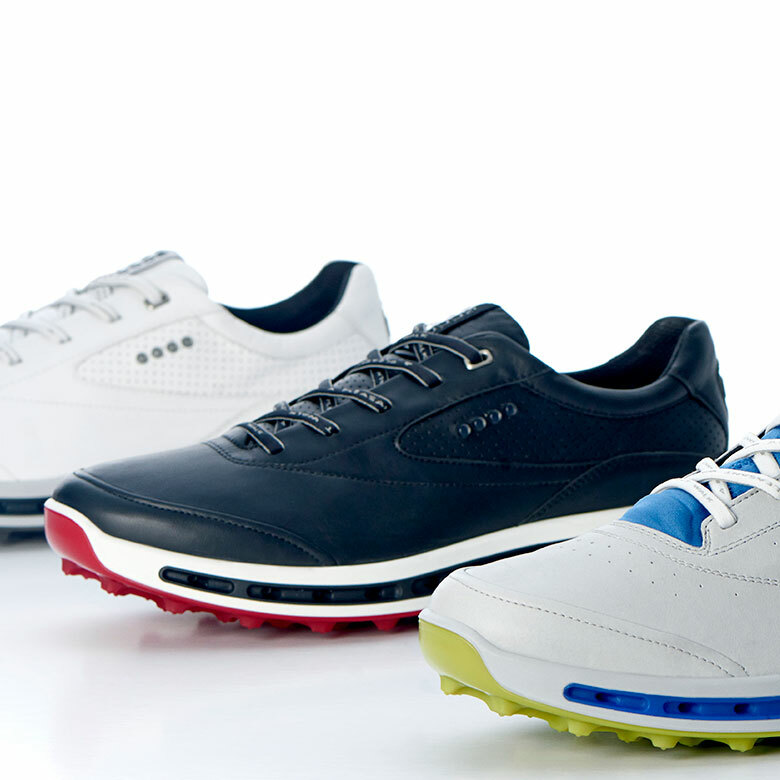 Hybrid is fashionable, on and off the golf course: ECCO has transformed the world of golf shoes with hybrid models. Many of the models are multi-purpose and are currently being used more away from than on the golf course. This generates more sales opportunities for golf shops. 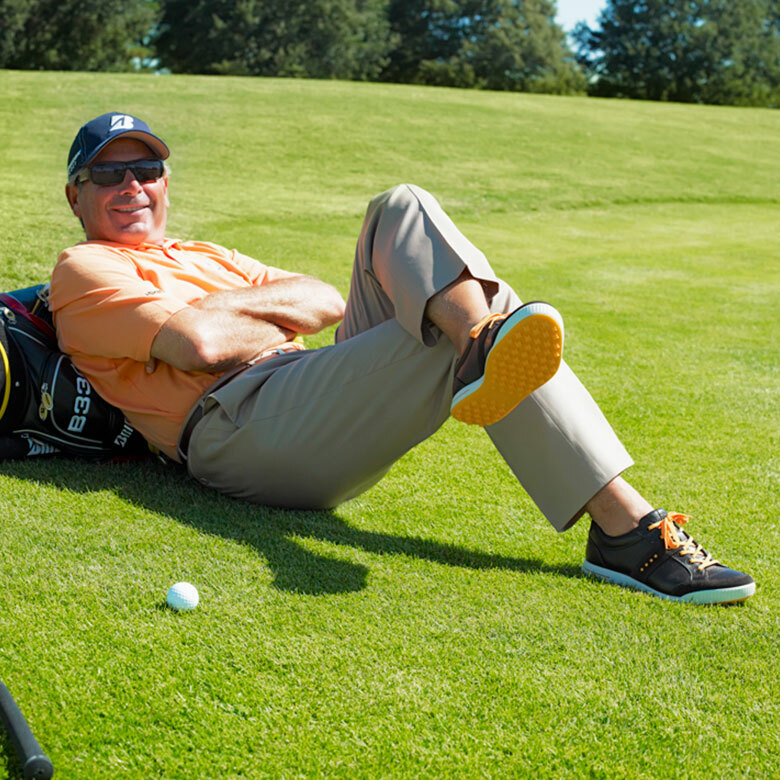 And you must not overlook the fact that ECCO shoes are so hugely comfortable and versatile that you can wear them both while playing golf as well as in many models for everyday use. Style and trends: When ECCO introduces a new model in its golf collection, it has often experimented with similar models in the streetwear collection with good results. This means you already know the style will also be successful in golf. Simply leather: ECCO is one of the largest artisans in the world of leather production. Therefore, it is virtually the only golf brand that uses 100% leather. Production processes: Thanks to being a leather producer and having its own factories, all production processes are closely monitored, thus generating unique methods within the global industry, ranging from tanning of the cow leather to the shoe’s final finish. Waterproof system: All shoes are constructed in one piece, thanks to the “Direct Injection Technology” system, thus preventing water from penetrating between the sole and the upper last. This means its performance is exceptional and unique in the world of golf. Design and technology: Scandinavian-origin is synonymous with leadership in high-tech and the most avant-garde design. Speaking of heels: With ECCO you will find a multitude of soles that adapt to the most demanding requirements, thanks to the variety of shapes and adherence. Focus: As ECCO is continuously developing new technologies for golf shoes, it outlines a particularly interesting future and specialisation in the world of golf. BOA system: The new BOA closure system has been a huge success, and it is increasingly being applied to more models, thanks to its easy, comfortable and innovative fitting adjustment, adapting perfectly to your feet. The most ergonomic shoe that exists: ECCO footwear is created as part of a bio-mechanical study of foot movement. Thanks to this, the shoes help to ease any problems you might have with back, knee and foot pain, highlighting an improvement in blood circulation of the feet – which makes them even more comfortable. Encouraging customers to check out an ECCO shoe is our main objective. Because once they touch it, try it and let their feet feel the shoe, there is more than a 90% chance they will buy it. And you… do you move forward with ECCO? All products using GoreTex® technology fulfill the pledge “GUARANTEED TO KEEP YOU DRY”. The shoes are made from Yak leather. This is because Yak leather is three times more resistant than leather from cows. Technology is used to treat the leather to ensure feet remain fresh and dry throughout the day. Biom Natural Motion technology was created with the philosophy of providing the capacity for feet to bend and twist in a natural way within the shoe. The enclosed Boa system enables quick and easy tying-up with shoelaces. This technology results from sequential innovations linked to the impact of the heel, transition of movement and foot comfort within the shoe.